“Ageing Australia’s demographic time bomb has detonated and the fallout is transforming every nook and cranny of the nation’s life. It might sound far-fetched. But greying hair is just the tip of a thread leading to the doubling of government spending on aged care and health to more than 13 per cent of the nation’s gross domestic product over the next 50 years. Those that have already reached 65 years are likely to live into their 90s, with some studies expecting large numbers could hit the ton before the sun sets on the Age of Aquarius. Their ageing – and fewer young people entering the workforce – is likely to blow a $900 billion hole in the budget by 2042. The article elaborates that many adults are using super savings as a means to help keep their lavish lifestyles, which has sprung several bold suggestions like tightening the belt on cash withdrawal upon retirement. 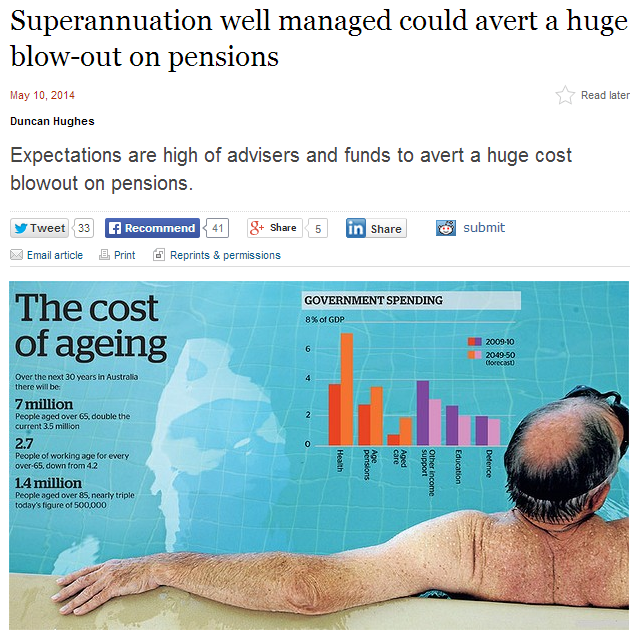 The ageing population is only one of a variety of problems that the Australian government should deal with today. This truth applies to doctors as well. Despite the fact that they earn a considerable amount of money, it is important that they make the most out of their financial plans. Doctors in Victoria should consider seeing medical accountants in Melbourne to help them settle their finances. Doctors lead very busy lives, so it can become easy for them to mishandle their finances, such as mortgage and business expenses. Living in Melbourne can also be painful, with the cost of goods and services in the city on par with the country’s largest city, Sydney. This is why it is better for doctors to contact reliable medical accountants to do their paperwork for them. Accountants like those associated with MEDIQ Financial Services can help doctors save time and money. They can also help the medical professional expand his reach and save up for his retirement years. As the Australian government is bound to tighten up everyone’s financial belts, it is important for doctors to start preparing for their golden years. Calling a medical accountant service is the first step to a stable life after hanging the doctor’s coat.